What a great day to celebrate Mother’s Day amazing ideas, delicious recipes and of course all our love to our moms. The #SundaySupper family is so happy share with you the joy and happiness for Mom on this day. If haven’t plan anything yet, just look around all the recipes and ideas the we have for you, remember you must make the best for mom on this day. Me, my family plan a great breakfast, and thats way this Mini Pies are perfect, you serve this with coffee or tea and you are go to go. Making the best day for Mom is what we are looking here and am sure the she would love wherever you make for here, just remember love is the best gift always. In a bowl mix together strawberries, vinegar, sugar and cream cheese, until well combine, ad one egg and mix, set aside. Roll out the pie crust and cut out rounds with a cookie cutter. In a muffin tin place one round in the mold and shape it, pour 1 1/2 teaspoon of the filling and place the other round on top, pinch the two together so the filling does not come out. Beat together one egg wiht the teaspoon of water and brush the pies on top, they are going to look beautiful. Once they ready place on a wire rack to cool completely. Serve with some homemade whipped cream. This recipe makes 24 mini pies. Don’t worry if you need a last minute idea to make for Mom, check out this amazing recipes. Make sure you take a look at what all the other #SundaySupper participants are sharing for Mother’s Day! Don’t forget to join the #SundaySupper conversation on Twitter today to celebrate Mother’s Day! We’ll tweet throughout the day and share our delicious recipes. Our weekly chat starts at 4:00 pm PT. in the chat. Check out our #SundaySupper Pinterest board for more delicious recipes and food photos. 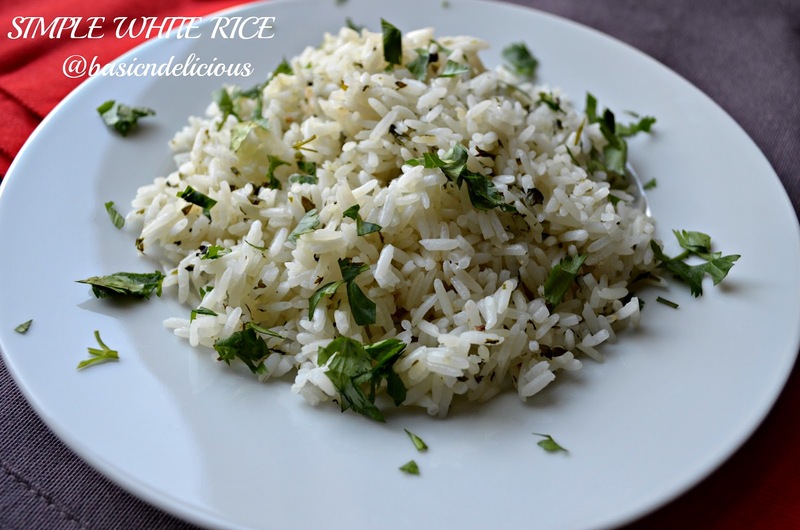 This is the basic recipe of how to prepare a delicious white rice. It’s amazing how many people prefer to buy the rice cooked and do not realize how easy and delicious it is to make it at home. No need for magic tools, all you need are some simple steps to make the white rice always comes out perfect. This rice is the foundation for a lot of recipes you can make a full meal, simple, delicious and healthy. I invite you to try this recipe and you’ll never buy cooked rice. In a saucepan heat oil over medium heat add the garlic and rice, stir for 5 minutes, this process is called toast the rice, add salt and cilantro stir well. Add hot water, stir the rice when you incorporate the water. Cover and reduce heat, simmer for 20 minutes, do not lift the lid of the pot when the rice is cooking. Having completed the 20 minutes, lift the lid and stir with a fork. Cover the pan, turn off the heat and let rice sit for 10 minutes. Before serving, stir the rice with a fork again. Esta es la receta basica de como preparar un delicioso arroz blanco. Es increíble como mucha gente prefiere comprar el arroz ya echo y no se da cuenta lo fácil y delicioso que es prepararlo en casa. No necesita de herramientas mágicas, lo único que necesita son unos pasos muy simples pero delicados para que el arroz blanco siempre le salga perfecto. Este es el arroz base para una gran cantidad de recetas que usted misma puede elaborar, una comida completa, simple, delicioso y saludable. Lo invito a que pruebe esta receta y nunca volvera a comprar arroz en ninguna parte. En una olla caliente a fuego medio el aceite agregue el ajo y el arroz, revuelva por 5 minutos, a este proceso se le llama tostar el arroz, agregue la sal y el cilantro, revuelva bien. Agregue el agua caliente, revuelva el arroz mientras incorpora el agua. Tape la olla y baje el fuego, deje cocinar por 20 minutos, no levante la tapa de la olla cuando el arroz se este cocinando. Cuando ya hallan pasado los 20 minutos, levante la tapa y revuelva con un tenedor. Tape la olla, apague el fuego y deje que el arroz repose por 10 minutos. Una vez pasado el tiempo mueva un poco el arroz con un tenedor y sirva.